December 2018 saw some incredible fossil research being published. In this article I summarise what fossil discoveries occurred and which one discovery stood out to me the most over the Christmas period. Happy New Year everyone! Finally after having some time off from the blog I am back and ready to share my views about some really incredible fossil discoveries. December 2018 was a rather big month for palaeontology. It was quite funny really that all these discoveries/research came within weeks of me taking a break from Jurassic Finds for Christmas. During this time as these incredible research stories kept coming out I really wanted to cover them but really needed the break. Thankfully though I can cover them here now, so let’s break down what happened shall we? On the 14th of December palaeontologists announced a new species of ceratopsian. This new dinosaur called Crittendenceratops krzyzanowskii was found in Southern Arizona and lived during the Late Cretaceous, some 73 million years ago. The research surrounding this incredible new dinosaur discovery was published in the New Mexico Museum of Natural History & Science, accessible through ResearchGate. Then on the 17th of December really important research was published by an international team of palaeontologists including palaeontologists at the University of Bristol about the analysis and discovery of feathers on pterosaurs. The research about this amazing discovery was published in the journal of Nature Ecology & Evolution and was also covered by various News and Science websites including: The BBC News, Discover Magazine, Science News, Live Science and many more. An artist impression of Crittendenceratops krzyzanowskii a new ceratopsid which was found in Arizona. Image credit: Sergey Krasovskiy, 2018 via Science News. This wasn’t the end of Mesozoic fossil stories though, on the 17th of December the National Geographic ran a story about the unveiling of Zuul crurivastator a new ankylosaurid. Its name Zuul based on the demon demigod from Ghostbusters 1984 with crurivastator meaning ‘Destroyer of Shins’. Zuul was announced in 2017 but the skull and tail of this very well preserved ankylosaurid was publicly unveiled on the 15th of December at the Royal Ontario Museum, the exhibition runs from December 15th 2018 to May 20 2019. More recently on the 8th of January research was published by palaeontologists in Peer Journal about the CT skull and brain case analysis of a rare ichthyosaur, called Protoichthyosaurus prostaxalis, found in Warwickshire it lived during the Lower Jurassic some 201 million years ago. A photograph of the skull of Zuul crurivastator at the Royal Ontario Museum. Image credit: Brain Boyle, 2017 via New Atlas. What fossil research story stood out to me the most over December? All the fossil research and discoveries that occurred over December were all very important. The discovery of a new species of ceratopsian: Crittendenceratops was very exciting and the news about Zuul crurivastator going on public display for the first time was also fascinating to read about. However one piece of research stood out to me the most over December being a pretty major discovery in its own right and confirming a long held theory. This was the research about pterosaurs being confirmed as having external feathers (pycnofibres). The fossils of the pterosaurs themselves came from China at the Daohugou Formation in Inner Mongolia. 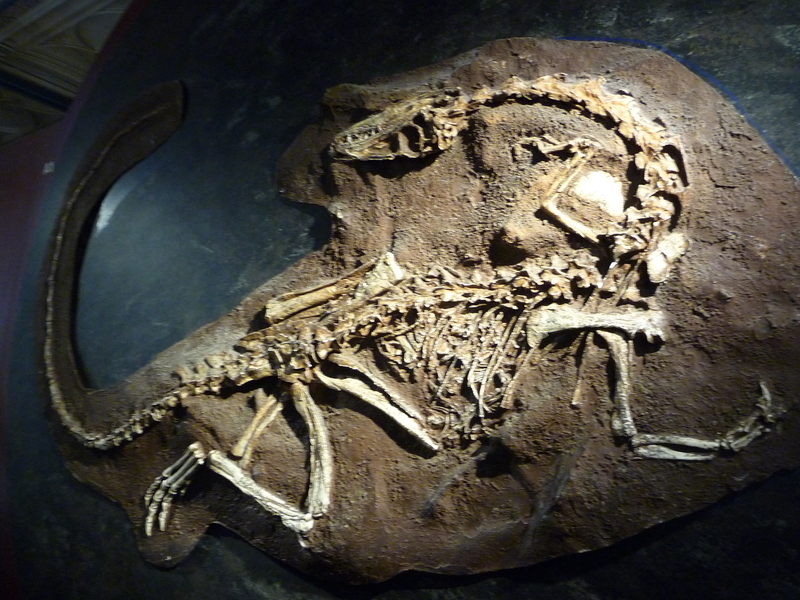 China is a country which has been continually supplying new dinosaur and Mesozoic discoveries. I have covered some of these amazing discoveries here on Jurassic Finds before, most notably the dinosaur discoveries of Lingwulong shenqi and Caihong juji. Unlike these discoveries the pterosaur feather research wasn’t by chance, palaeontologists had the goal of analysing the fossilized feather samples to find out more about pterosaur evolution. The result was pretty remarkable with four types of feathers being distinguished: simple filaments, bundles of filaments, filaments with tuft half way down and downy feathers. All evidence that feathered evolution within archosaurs was much more complicated and complex than previously thought. Artist impression of the short tailed Daohugou pterosaur which was studied. Image credit: Yuan Zhang, Nature Ecology and Evolution 2018 via The Metro. I hope you have all enjoyed reading this summary article. It is a bit different to what I usually write but I wanted to just break down what had happened over December. I am planning on supporting Jurassic Finds over this year with one full article each month, covering recent discoveries and research. This is less articles then last year but due to my own palaeontological research I am having to juggle between article writing for that, editing my Masters application, applying for jobs and writing articles for The Jurassic Park Podcast. However I am utterly thrilled that the blog managed to reach over 4,000 readers in December capping 2018 off with a really fantastic achievement, I am very Thankful to all of you who read my articles and are interested in what I have to say. I would also like to say ‘Thank You’ to the 99 people who have read my blog since my last post in December. Undoubtedly the blog this year will probably see less views which is perfectly fine, but I will try and keep Jurassic Finds as active as I can over the year and if a major palaeontological discovery breaks I will be looking to cover it as soon as possible. I look forward to sharing more about the latest fossil discoveries with you all very soon this February! Previous Jurassic Finds sees over 4,000 readers in a year! Thank you everyone! Next New Fossil Discovery Article Coming Soon!